What’s your new roof in Rochester NY protecting? Your family and possessions? The structural integrity of your home? The answer to all of these questions is yes and all under one asphalt roofing system. When you choose RFS to perform your roofing tear off and lifetime roofing install you have made a decision that will assure quality, curb appeal and protection that will last for decades. RFS is taking roofing Rochester NY to a higher level. We outperform our competition in every category from estimation to installation. Keeping your home protected and giving you peace of mind for years to come at an affordable price is our only priority. All it takes is one call to 585-288-0895 today to arrange your free roofing estimate in Rochester NY. Our owner Ron Ferris Jr will meet with you personally to estimate your roofing project and discuss your residential roofing options and each of their benefits. Once you have signed up for our roster and been given an installation date our in house factory trained and certified roofers will work dilligently to complete your roofing project with efficiency and quality. 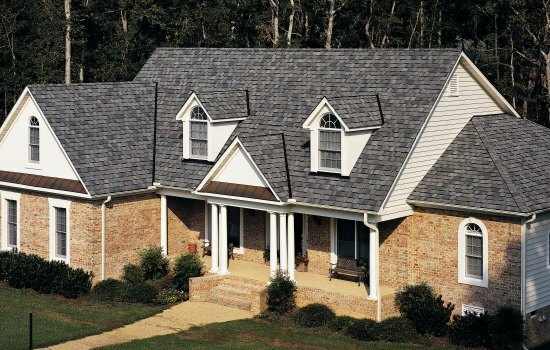 We proudly install Certainteed Landmark shingles and roofing underlayments as the core of ourIntegrity Roofing System. A complete systems approach comprised of the highest quality roofing materials and installation techniques. Our Walworth NY roofing company always protects your home’s vinyl siding and landscaping when performing a roofing tear off. We also remove our dumpsters daily so as not to burden our clients. All of our crew members adhere to a strict code of conduct and every completed roof is subject to a stringent project checklist. At RFS we pride ourselves on meticulous job site appearance and clean up. RFS carries full workmans comp and liability insurance so you can always rest assured knowing your home and assets are protected while working with us. We are well known members of our local community and have a great reputation amongst the families and neighbors of the Greater Rochester area. Call today and see why our exceptional attention to complete customer satisfaction has earned us a rating as one of Angieslist top service providers for roofing Rochester NY. So much depends not only on your new roof but who installs it, so get it right the first time with the pros at RFS! Let us handle it right and schedule your free roofing estimate today at 585-288-0895 or visit or main site at ronferrisandsonroofing.com to request your free estimate online. Making sure that your Rochester NY seamless gutters are working at peak performance is crucial in preventing damage to your home and its exterior. Keeping your seamless gutters and downspouts clear of leaves and debris is essential to keep them functioning properly. Cleaning gutters and downspouts in can be messy, difficult and sometimes dangerous. Hiring a roofing contractor in Rochester NY to keep your gutters clear can also add up significantly over several seasons. The pros at RFS, your local neighborhood roofing company is committed to finding solutions that will last for years to come and provide our clients with the least amount of maintenance possible. After 30 years we continue to use ONLY the highest quality materials and systems. When it comes togutter guards in Rochester NY and keeping the debris out there is only one choice! Rhino gutter guards is the most technologically advanced gutter protection system available. If you need low maintenance, high performance cost effective gutter guards and gutter guard installation in the Greater Rochester area look no further than Ron Ferris and Son and Rhino Gutter Guards. – Embossed aluminum texture that minimizes surface contact with debris. This promotes much easier leave and debris removal. – Not only does Rhino gutter guard prohibit any debris and leaves from entering your gutter, it also strengthens the entire gutter system once installed. RFS is Rochester NY’s authorized dealer and installer. Our owner Ron Ferris Jr has been roofing Rochester NY for over 30years. He knows that not every roofing or gutter system are the same, nor is the way they function. Together we will form a plan with you and help you better understand the many benefits of gutter guards and how they function to protect your investment. Our teams of in house installers are factory trained and certified to make adjustments when necessary during the installation process to ensure maximum performance. Rochester NY roofing tips from one of the best roofing contractors in Rochester NY. Whether you have a cedar shake, asphalt shingle or flat roof in Rochester NY, RFS has always worked hard to help our clients uncover and resolve roof leaks. There are many roofing services in the area promising the same level of quality roofing installations as RFS, only to deliver low cost roofing materials and sub quality roofing applications. We have been serving the greater Rochester NY area for over 30years. Our outstanding reputation has earned us the opportunity to serve many home and commercial property owners for over three generations strong. Our Roofing Tip of the Day – Focus not only on the price of your roofing quote, but also roofing materials and warranties,workmanship warranties and procedures as well as reputation throughout the community. Make sure you feel comfortable working with your Rochester NY roofing company. Get more than one free roofing estimate to ensure you purchase the best quality service and roofing products available. Remember quality services cost more but save you long term. At RFS we have lost many roofing tear offs in Rochester NY to lower bidders only to be called in later to fix the roof leaks they caused. Make sure you inquire if your roofer has the proper workman and liability insurance to perform roofing. If he does not and your property is damaged or any person on the job is injured he and you are not covered. Your new roof is the only thing protecting your family and home from the harsh elements of the weather, so please make sure you put in the effort as a homeowner to find a QUALIFIED roofing services in Rochester NY. Ask your roofing company to see samples of their different available asphalt shingle options. Tell them you want to see samples of the roofing drip edge metal, ice and water shield, synthetic underlayment and roofing ventilation they plan to use on your new roofing system. These components coupled with a high quality installation will determine whether or not your new roof will stand the test of time. Remember, thirty years is a long time…..do you really want to cut cost and corners. We provide our clients with free roofing estimates in Rochester NY. Our owner Ron Ferris Jr will meet with you at YOUR convenience to present to you all of your different residential roofing options and how they outperform low end products. Again focus not only on the dollar amount of each individual roofing company but take a good look at the roofing products and services they provide. Ask yourself whether or not you think each roofer will be there for you in the future should you need him. Times are tough and we all want to save money but new roofing is not a project to be taken lightly or one you want to have done twice. Most roofing companies in Rochester NY will measure your roof and spit out a quote without ever meeting with you or send out one of their high pressure sales people. At RFS, our owner sits down and personally assess your roofing project and needs. He will explain your different roofing options and costs as well as the benefits of choosing RFS but ultimately feels it is your decision and never pressures you to use our services. Protect your home and your family by hiring the best from the beginning and it will save you a lot of money, headache and damage in the long run. If you would like to know more about our Roofing Tips or are wondering how much a new roof costs in Rochester NY call the pros today at RFS at 585-288-0895. Or visit us online at our main site at ronferrisandsonroofing.com to see all of our available roofing services and request your free roofing estimate online! After a century of making roofing materials that really last Certainteed is still standing strong. In fact their asphalt roofing shingles are rated number one by America’s building and remodeling professionals. So whether you need a roofing tear off in Webster NY or a flat roof in Brighton NY you can turn to Certainteed roofing materials with confidence. They manufacture complete roofing systems with the industry’s leading strongest lifetime roofing warranties. At RFS we only use high quality roofing materials like those made by Certainteed. This ensures our client’s are receiving better roofing systems not to mention lower life cycle costs. It’s all part of our promise to you. Certainteed’s Master Shingle Applicator program provides education to roofing applicators in every aspect of shingle installation, acceptable roof decking, and proper roofing ventilation. It also covers professional conduct and workmanship. Most importantly it teaches roofing applicators specific approved installation guidelines for installation of all Certainteed roofing shingles and underlayments. This is very important because it will ensure that your new roofing system from RFS will comply with all lifetime warranty standards. RFS has been roofing Rochester NY for over 30 years. Our focus has always been and will continue to be on providing our clients with the highest quality roofing installations. We only use the best roofing materials available to roofing contractors in Rochester NY and provide the best installation possible allowing us to provide a personal workmanship warranty paralleled by no other roofing company in the area. That’s why our owners knew Certainteed’s Shingle Master Program and Lifetime Roofing System was a perfect match for RFS and our clients. RFS offers a SURE START PLUS WARRANTY- a true lifetime roofing warranty that covers not only the installation of a new roof, but also removal and disposal of the defective roofing materials. RFS employs at least one MSA job supervisor and a minimum of two MSA applicators on every roofing job site. These crew members have all been submitted to training, testing and SMA credentials courses with their Certainteed territory manager. Sure Start Plus Warranty provides the strongest extended warranty coverage in the roofing business and is the standard by which all other North American roofing manufacturers have followed. It extends the coverage and duration of the standard Sure Start protection when a credentialed roofing company in Rochester NY like RFS installs your new roof. Protect your investment and your home with the best. Demand a Certainteed Lifetime Roofing System installed by a MSA credentialed roofer.